A view of the tower entrance at Notre Dame High School on Moylan Avenue. 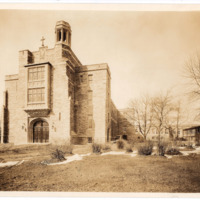 The high school buildings were once used by the Academy of Notre Dame until 1936 when it was transitioned to a diocesan high school. A side view of the Notre Dame High School on Moylan Avenue. The high school closed in 1981 and was bought by the Pennsylvania Institute of Technology to be used as a new campus for their growing student base. 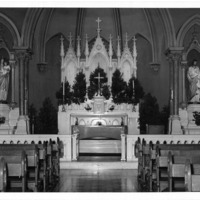 An interior view of the chapel at Moylan, showing the altar, statues, and pews. 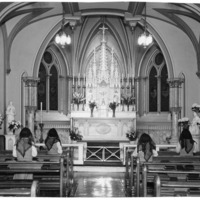 The chapel was built in 1907 and was the first in America to be dedicated to the Order's foundress, St Julie. 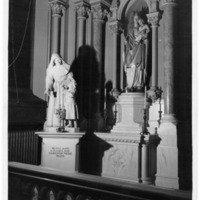 Two statues, one of St Julie with a young girl and one of Mary and Jesus, were located in the chapel at Moylan. 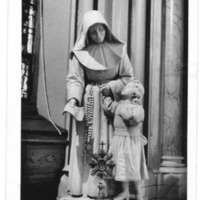 There is also a reliquary of St Julie by her statue. 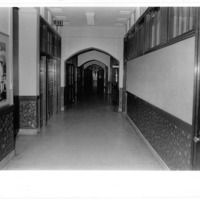 A photo of the interior of Notre Dame High School. There was a large growth of the student body in the 1950s, and by 1954, there were 1,485 students attending the high school. 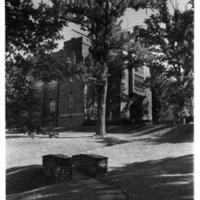 A view of the convent and Notre Dame High School at Moylan. 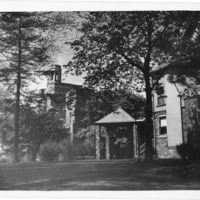 The site was originally used by the Sisters at West Rittenhouse Square as a summer residence beginning in 1902. 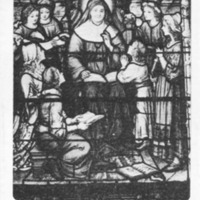 A card of the stained glass window of St Julie surrounded by children located in the chapel at Moylan. 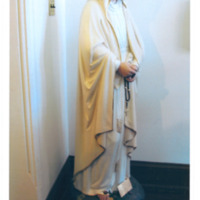 A close-up of the St Julie statue inside the Moylan chapel. A reliquary is placed before it on the pedestal. 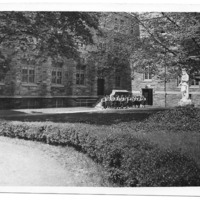 A group of students in brown jumper uniforms walking across the courtyard at Notre Dame High School at Moylan. 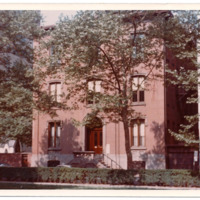 A view of the former Notre Dame Convent and Academy of Notre Dame's front entrance, located at West Rittenhouse Square. 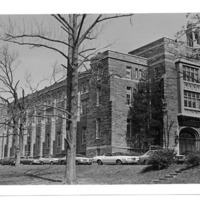 Due to the cost of maintenance and upkeep to the building, the Sisters closed the school in 1966 and sold the property in 1967. A view of the interior of the Notre Dame Convent chapel at West Rittenhouse Square. 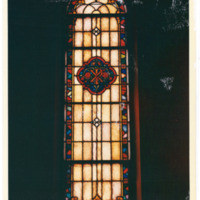 A photo of one of the stained glass windows at the Notre Dame Convent chapel at the Square. 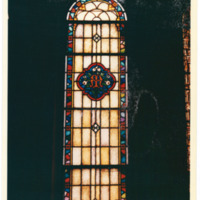 A photo of the stained glass window with the Sisters of Notre Dame crest at the convent chapel at the Square. 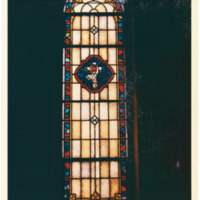 A photo of a stained glass window of the Holy Eucharist at the Notre Dame Convent chapel at the Square. 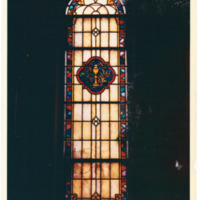 A photo of a stained glass window showing lilies at the Notre Dame Convent chapel at the Square. 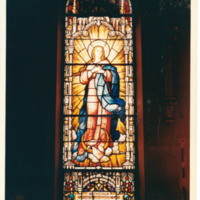 A photo of an elaborate stained glass window of Mary at the Notre Dame Convent chapel at the Square. 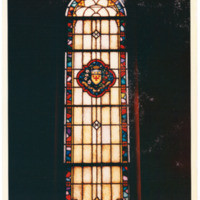 A photo of a stained glass window of the Sacred Heart in the Notre Dame Convent chapel at the Square. 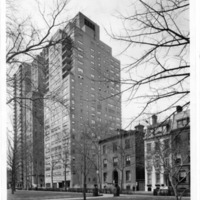 A view of the growing high-rises in the Rittenhouse Square neighborhood. The current neighborhood is populated by many high-rises.